Designed for Safe Clean Up of Bio Fluids - Red-Z & other Fluid Control Solidifiers: Any type of profession that deals with and/or come into contact with blood and fluid waste products have a higher then normal probability of exposure to potentially infectious hazards. 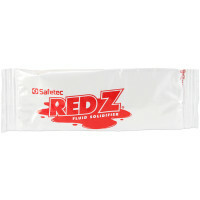 Our Red-Z Fluid Control Solidifiers which are available in individual packs & Fluid Control Solidifier Shakers, are your tool to clean up any type of these highly infectious messes. They were engineered to solidify and deodorize the liquid hazards and make for easy cleanup! Red-Z Fluid Control Solidifier, Red-Z Fluid Control Shaker, hazardous fluid pickup, blood solidifier and more. 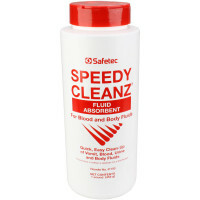 Body Fluid Cleanup & Bloodborne Pathogen Protection? 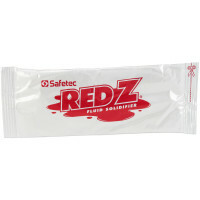 RED-Z Solidifier is designed to make the clean up of bodily fluids a safer, more controlled procedure. It is a unique and fast-acting encapsulator, which quickly solidifies blood and other bio-fluids. Makes handling, transportation and disposal a safer process. BBP & PPE Protection Wholesale to the Public Manufacturer Direct Safety Product Sales since 1993.